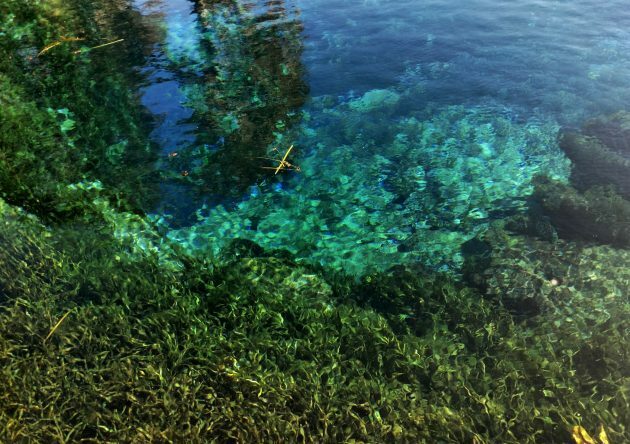 At the end of October, my family flew to Florida for a multi-day road trip aimed at the beautiful springs. Bubbling up from underground aquifers, the springs are known for their constant 70-72 degree F temperatures and impressive clarity. We had an ambitious itinerary planned: six springs within eight Florida State Parks. One of the highlights of the trip was a glass-bottomed boat ride in Silver Springs State Park, one of the newer additions to the state park system. My mom, dad, grandmother, and sister piled out of my small silver car to stride across the wooden boardwalk beneath huge cypress trees towards the entrance. Four o’clock had just struck when we boarded the electric motor boats. The bottom is actually glass, carefully polished to act as a literal window to the aquatic world beneath us. Water quality was good that day, and we could perfectly see the waving eelgrass, the freshwater fish species, the adorable turtles. From spring hole to spring hole we slowly moved, our captain providing running commentary on the number of gallons flowing from Silver Springs, the number of movies that had been shot here, and the wildlife seeking shelter within the cool waters. In addition to interesting fish views, the glass-bottomed boat tour and clarity of the spring in general provided an unparalleled opportunity to see diving Double-crested Cormorants and Anhingas. How to describe these underwater avian species? An Anhinga dries its wings. I know it’s cliche, but they do look like they are swimming beneath the surface. Bubbles cling to their wings as they rapidly descend, fish fleeing in all directions, seeking cover where they could in the eelgrass. 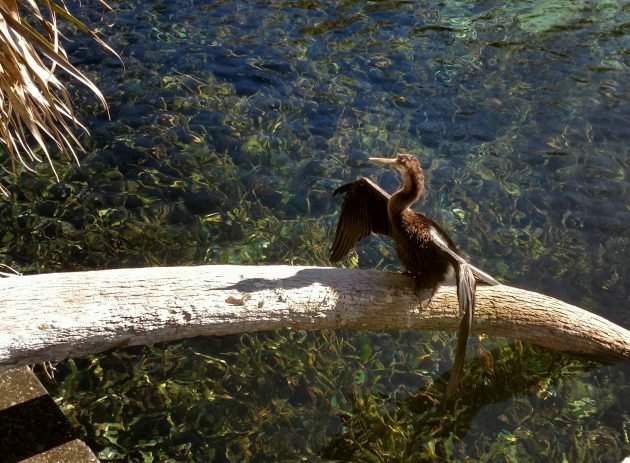 Of course, Anhingas have caught on to their hiding techniques. The boat trip seemed to end too soon, so we walked the edge of the spring, looking down from a high walkway. An Anhinga busily sought prey, periodically ducking down into the grasses and completely disappearing from view. We watched for a few minutes, waiting for the Anhinga to pop back up to the surface. Eventually he or she did – but yards away from where the bird disappeared in the first place. Quite the underwater expedition! When birding, our gaze is almost always facing upward as we scan the canopy and the skies for our feathered friends. Silver Springs’ unique water clarity allows viewing of some of our most common diving birds in relatively natural habitat. Other than donning a snorkel mask and being in the right place at the right time, I don’t know how to seek these beautiful aquatic birding experiences!